Presidents of Russia and Syria met in Sochi to discuss "the inevitable defeat of terrorists"
On November 20, Russian President Vladimir Putin held a meeting with his Syrian counterpart Bashar Assad in Sochi, RF. 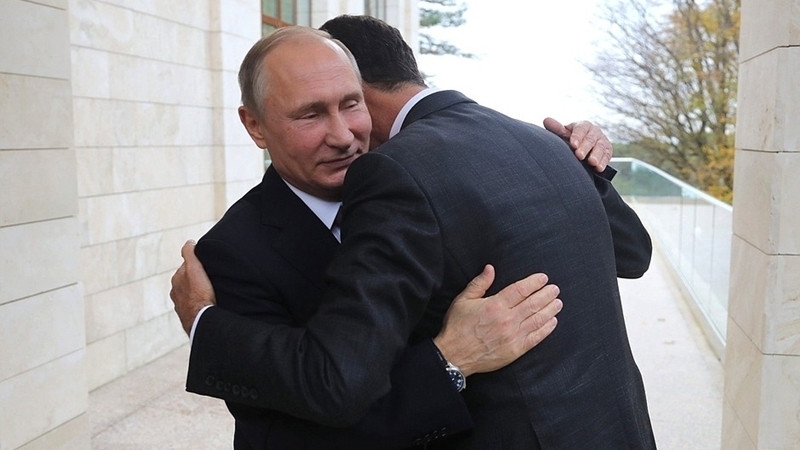 Reportedly, Putin presented Assad to the leadership of the Ministry of Defense and the General Staff of the Armed Forces of Russia, who were present in Sochi for the next series of meetings on military construction and the state armament program. The Russian leader congratulated the colleague on the results that Syria was achieving in the fight against terrorists, as well as on the fact that the Syrian people are "gradually approaching the eventual, unavoidable defeat of terrorists," the Kremlin press service reported. At the meeting on Monday evening, Presidents of Russia and Syria, Vladimir Putin and Bashar Assad, agreed that the military operation in Syria was nearing completion and now it is necessary to move on to political processes. “Of course, it is still very far to the complete victory over terrorism. But as for our joint work to combat terrorists in Syria, this military operation is really coming to an end," Putin said. "I think that now the most important thing is, of course, to turn to political processes, and I note with satisfaction your readiness to work with all those who seek peace and settlement," the Russian president added. Assad in turn stated that he expected Russia's support in the issue of a political settlement in Syria. “During this period, great progress was achieved, both directly on the battlefield, and at the policy level. Many areas of Syria are liberated from terrorists, and the Syrians who had to leave these areas earlier were able to return," Assad said. "We must admit that this operation allowed us to promote a political settlement in Syria," the president of the Syrian Arab Republic said, as cited by Russian media. The last time Putin and Assad met in October 2015, when the Syrian dictator secretly flew to Moscow. Earlier, the US Secretary of State Rex Tillerson said that there is no role for Syrian President Bashar Assad in the future of Syria.